at the beginning of this course, you may remember reading about the "Mercantilist Theory". It is difficult to stick to an "export only" objective because most countries are not 100% self-sufficient in all products, services and resources - there are lots of things that need to be imported in order to create "stuff" we need to consume. Adam Smith said - each nation should specialize in producing things it has an "absolute advantage" . The theory of "Absolute Advantage" seems to make sense in situations where the circumstances of the geographic and economic environment are relatively simple and straight forward. Because of the gift of our natural resources, Canadians are definitely better at producing wood products than the Japanese, and Japan's industrial magnificence is better at producing electronic consumer products than Canada, so we should trade - but does this mean Japan should import 100% of its wood products and we should import 100% of our consumer and industrial electronics? Comparative Advantage: In most cases, a straight-forward Absolute Advantage does not exist in the real world. Some countries may have an advantage in one commodity, and also a slight advantage in another commodity - however there is still an opportunity for them to trade. Although Canada has companies like R.I.M., which make the BlackBerry, and Nortel, which makes telecomm devices and equipment, it makes sense to import a lot of consumer and industrial products and services from Asia, Latin America and Europe. role While the Canadian Dept. 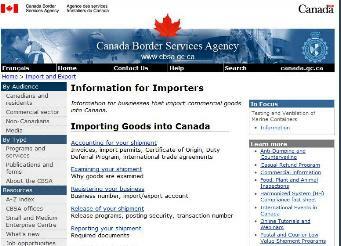 of Foreign Affairs and its Embassies and Consulates around the world are a great source of help for Canadian exporters - don't expect much help in importing - many staff at Canadian Embassies overseas will little time providing assistance on importing since the government mantra is that "exporting is good, importing creates a trade deficit". Importing is big business Importing is just as big a business as exporting, for the simple reason that every persons export, is someone else's import. Planning carefully, and understanding the influences of the 6 environments, can allow people in the importing business to make a lot of money, whether they are selling components and raw materials to manufacturers, or importing finished products for direct retail. examples can be found in many areas of business such as auto parts, communications technology, resource processing, etc. Import & Exporting reasons similar ? Did you notice that the items in the list above are very similar in order and explanation to the list discussing "Why companies export" - this should help you understand that importing and exporting are obviously closely related. If a company is involved in exporting for the purposes of being more competitive, chance are it is also involved in importing to secure cost reduction and have access to important production assets. "Commercial practices and financial systems differ widely between countries and, overall, the risk issues associated with overseas trading are wider in scope than in domestic commerce. Discussion of risk tends to focus on the exporter's position - that is, on the buyer's creditworthiness and ability to pay for the goods once shipped. But what about risks to an importer? When you purchase goods from a foreign supplier, you will need to consider the impact of foreign currency exchange, transport, insurance, and customs duties on your profit margin. The list below summarizes some of the risks that you might encounter." "Risks In Transit - Will the shipment arrive undamaged and in good order? Currency Risk - Can fluctuations in exchange rates be accounted for? Will the terms that you have negotiated put you at risk of currency fluctuations? Interest Rate Risk - If the terms of payment are fixed, will a change in interest rates affect your ability to pay? Documentary Risk - Will your shipment be subject to delays at customs if your supplier fails to prepare required documentation? Are the goods perishable?" Vincent Barboza, Regional Manager, Trade Finance, International Trade Centre, of the Royal Bank, aside from having the longest title, is also a nice and helpful person who (July 8th, 2005) provided the link to the RBC site noted above. Copies of emails are kept in the permissions binder. Importers also face significant risks importing from regions in which safety is compromised by the intensity of the competitive environment. Meaning the competition among retailers, for lower prices, pushes the manufacturer (and importer of component parts) to seek the lowest price, regardless of safety considerations. W5 - the "60 minutes" of Canada, dealt with one aspect of this story in an October 2007 segement "Safe to eat?" "China is now Canada's second source of food imports -- after the U.S. That has some consumers concerned -- especially in light of safety scares about products from China." The consequence of stories like this effects Canadian companies that retail food and food ingredients that come from China. Like many trade associations, the Importers offers a lot of services to members. This particular association was originally formed to help Canadian companies with problems and challenges importing products in to Canada. The association lobbied the government for changes to restrictive import regulations and provided education and public relations functions for the member companies. "The Association provides Canadian importers with information on trade policy and opportunities, regulations and tariffs, trade missions and exhibitions, analyses of worldwide trade issues, effective representation to government and timely advice designed to keep importers competitive and profitable." One of the consequences of outgoing export oriented trade missions is that Canada is usually then obliged to host an incoming mission to give the companies of the other country a chance to sell their goods in Canada. In a situation like this, the Canadian Importers Assoc. is sometimes involved in hosting a reception, or planning some event so that people can meet and exchange ideas and information for trade opportunities. 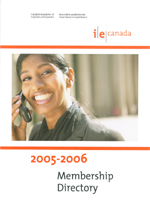 JOBS The Canadian Association of Importers and Exporters Inc., (www.iecanada.com) like other bilateral and multi-lateral trade associations has a membership directory. Obtaining a copy of the membership directory is a great way to start a job search in international business since most of these kinds of directories list specific executive contacts at each company. Sometimes the directories are sub-divided according to geographic region of interest, or by business sector, which would help you write more pertinent covering letters. Canadian Manufacturers & Exporters is considered to be a large association and well known among senior government staff at the federal and provincial level from "way back in the days" when it was just the CEA. Because of the government's emphasis on exporting vs. importing, the Canadian Importers Association always struggled to achieve the same prominence as the CEA. "Whether shipper, importer or freight forwarder, the Canadian International Freight Forwarders Association is important to you.... As a shipper or importer, it provides a source of professional level transportation services and a facility through which grievances can be aired, that being the Ethics and Standards Committee." Whereas SHIPPING comes under the category of PLACE in the 4P's of Marketing; shipping is critical to the success of any international marketing situation. Most industry associations have newsletters for the purpose of informing their members about the activities of the association, as well as the activities of other members, and also for the purpose of Public Relations with potential customers and other interested parties. Bottom line: since more and more small and medium sized companies will be shipping products and documents around the world to customers, the international freight and shipping industry will continue to grow - especially with the effect of e-commerce.